Disruptive Tech Property Industry Impact – Net Energy Cliff! The McKinsey name for this one was Advanced Gas and Oil Exploration but I was struggling to see a positive so I have renamed it Net Energy Cliff. This is the eleventh in my series on the McKinsey and Company 12 disruptive technologies and their potential impact on the built environment. First up why don’t I think Advanced Gas and Oil Exploration will be a positive disruptor on the property industry? I think the downside risk of the potential environmental damages from horizontal drilling, fracking etc etc are outweigh the upside risk of continued availability of fossil fuels, and that’s ignoring the continued emission of carbon into the atmosphere. I believe that the investment highlighted by McKinsey of 0.1 – 0.5 trillion dollars could be better invested firstly in energy efficiency / energy abatement and secondly in alternative power / fuel sources. If we rely on advanced oil and gas exploration figures such as 6.1 billions barrels of oil equivalent per year we are going to think all is well with the world, that peak oilers are doomsday merchants, that the price of oil isn’t linked to the cost of extraction and that after we have fracked out all the gas we will magically find another source. If we think all is well then we don’t need to worry about making anymore changes to our property industry. It does kind of scream of the alcoholic ringing out the beer from the beer soaked bar mat to get one last drink at the end of the night! The cost of extraction will continue to rise as we have to spend more money on advanced oil and gas exploration. It doesn’t come cheap to extract gas from fracking or oil from tar sands. That cost will be passed down to the consumer, whether its in the fuel you put in your car to get to work, or the oil in the plastic that is in the IT equipment you use in your office, or in the natural gas that is being used to power your building, the cost of oil and gas will impact our property industry. The energy needed to extract energy from the ground is increasing. When we first discovered oil it was so close to the surface and the wells were so full that it only took 1 unit of energy to extract 100 units of energy. Its known as EROEI – Energy Returned On Energy Invested – how much energy do I have to invest to extract energy from the ground. Tar sands runs close to 3 – we only get 3 units of energy out for one unit of energy in. Oil production now runs at 20. Natural Gas runs at 20. Some economists believe that to run a society we need around 5, and if we want things like iPads and other stuff it needs to be around 10. They call it the Net Energy Cliff. Now this could be huge. Think about how energy is used in buildings – their construction, their operation, the manufacturer of the stuff occupants use, the energy to refurbish our buildings, the energy to demolish our buildings. Energy is used in every aspect of our property industry. What is the Net Energy Cliff? At some point more and more energy is needed to extract more energy that it becomes ineffective to continue to extract energy. 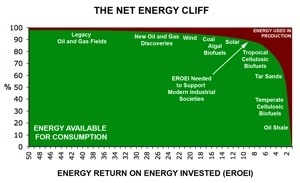 There is a turning point which is called the Net Energy Cliff – predictions are that this is around a EROEI of about 6. Australia looks to be fine and dandy if we ignore carbon emissions – coal has a EROEI of 80 and will be that way for a while now. But that is a big if! So its really going to hit the property industry in oil and petrol. Tar sands and shale oil already fall below the Net Energy Cliff. It’s only really the other oil sources that are about 20 that make up for the poor EROEI. Once the oil sources with high EROEI drop off the average EROEI of oil will fall below 10. At that point things will be very different! Materials that use some form of oil in production or manufacture will become very expensive and very rare. Commuting that uses petrol will become very rare. Transportation of materials will become increasingly expensive. Maybe the Living Building Challenge will become the default standard! I know that our Living Building Challenge project, the Sustainable Building Research Centre at the University of Wollongong is minimising the impact of oil in its construction and operation through using the LBC tool.